It is time for Our Daily Bread Designs Stamping In Time Challenge(SNTODBD18)! The assignment is ODBD stamps. Cheryl Walker is our challenge hostess this time. Cheryl is challenging us to ribbons and lace! When you think of ribbon and lace you are not just limited to the fabrics. If you have die cuts, punches, or even stamps that have a ribbon or lace look, name, or design, those can work, too. However, you do have to use both! We would love to see what you create using Our Daily Bread Design stamps! I used this week's Midnight Madness Sketch for my card. 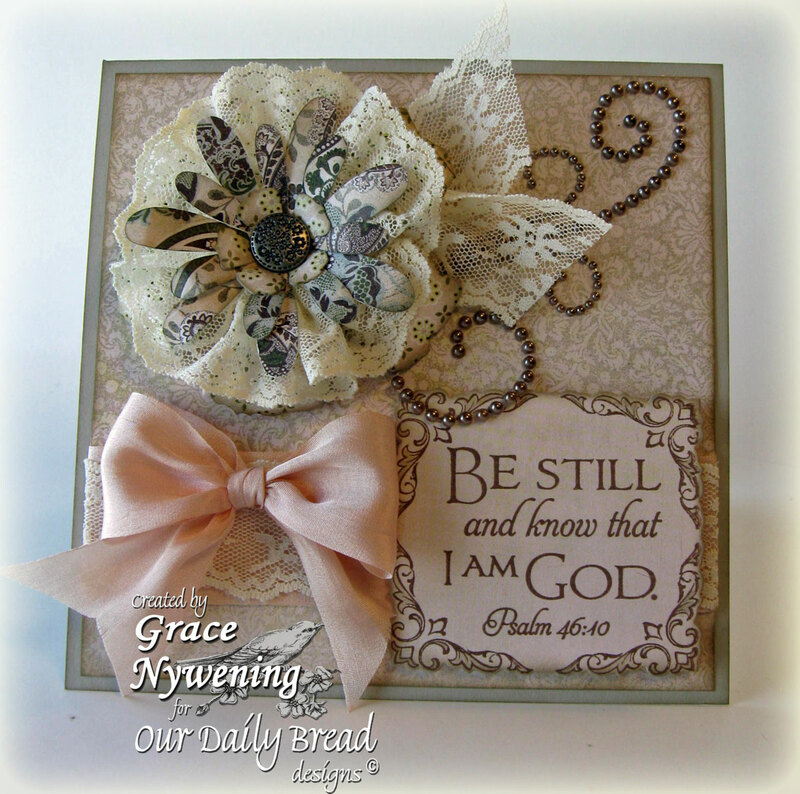 I used this month's new Our Daily Bread designs releases Brocade Background and Brocade Borders. I also used an older set, Scripture Collection 3 for my verse, which I just love. I wanted to show that lots of verses will fit in these frames, not just the ones from this month's release. I LOVE this brocade backgrounder and these frames!!! For my card I started with a base of Sahara Sand and then stamped on a peachy pink solid page from BasicGrey's Cappella pack with Sahara Sand ink and the brocade background stamp. My flower is made with a combination of elements using scraps from the Cappella pack and the T Holtz big flower die cut, and the daisy shape from my Cricut "In my Garden" cartridge. I also sewed up a lace ringlet for the flower and adhered it all with a big vintage looking brad. My ribbon is May Arts Silk (yummy) and the lace is from my stash. The pearls are ZVA Creative. Be sure to check out the rest of the DT Samples this week! They are truly stunning! Thanks Cheryl for a great challenge!!! Pocket Full of Posies - Floral Frenzie (when I layered up this flower I was on a frenzy LOL! Grace, this is beautiful! The lace and layered flower accenting is amazing! Gorgeous! Wonderful scripture card! Love this soft and beautiful card, Grace!!! The background is so pretty!! WOW so very beautiful and your embellishments are gorgeous!!! Thanks for joining us at Creatalicious!! Just gorgeous, Grace! Love the beautiful flower and all your wonderful details! Grace this is absolutely GORGEOUS, I LOVE LOVE your flower!!! AMAZING!!!!! I love that giant flower! It's so pretty!! This is stunning Grace!! I so love your take on the sketch and your added texture. The lace flower is so gorgeous!! What an elegant creation my friend!! Yowza,Grace! This is just amazing!! I am so loving what you have done with that flower you created!! Oh my!! Thanks so much for playing this week in the Midnight Madness Sketch Challenge! Hugs! Wow, love the flower with the lace! A gorgeous card all around. Really beautiful. Love the flower. Grace this is just beautiful. Your flower is simply amazing. Such beauty and grace for my eyes to behold. Great job with the sketch. Thanks for playing along with the Midnight Madness Sketch Challenge! WOW!!! The flower, the bow, the lace, the sentiment..... all is perfect!!! Thanks again for joining us at TSM challenge. Just so pretty, this is above and beyond elegant!! Your papers and flower are awesome. I love your lace and paper flower! What a pretty card. So gorgeous flowers and the details. WOW love that flower Your card is so beautiful. Thanks so much for playing at the first Gingerloft challenge. Beautiful lace flower Grace!! Elegant as always! I hope you have had a wonderful week! This is beautiful. Very exquisite. Awww Grace your card is Beautiful hun!!!! I love the flower,lace and your ribbon bow!!! WOW!! So gorgeous flowers and the details.!!! Thanks for joining us at Creatalicious!! Grace, are you trying to win every week??? This is SO GORGEOUS as are all of your creations. I just can't believe my eyes every time. I should be used to it by now, but I never do get used to it. I'm always thrilled to look at your work!! Great job on the MMSC. Gorgeous card, Grace! I adore the Border corners! What a wonderful card! I love the lace in the bg, and that flower is so beautiful! I wish you could show us how you made it! That is one of my all time favorite verses. I learned it at a very young age...and have always known that it was true. I love the beautiful brocade frame you put around it with the ODBD Frame and Scripture. Great idea to show that it works around the larger Scriptures, too. You are such a dynamic woman, artist, and Child of God. Just lovely. Really like your lace accents! Thank you for joining us at the Stamping Vacation Challenge blog. Grace,wow what a gorgeous card you have created. Beautiful take on the sketch challenge this week at Midnight Madness! I linked here from the MMSC sight and i just wanted to let you know that this is a really elegant card! One of my personal favs this week. Congrats on MMSC Gold Star last week Grace. Your cards are always so beautiful to behold. This one included of course! That flower is amazing with the lace and paper combined. Thank you so much for playing the Midnight Madness Sketch Challenge this week.